The Vs. Recorder makes another appearance in Pokémon X & Y, being given to you as you enter Kiloude City. 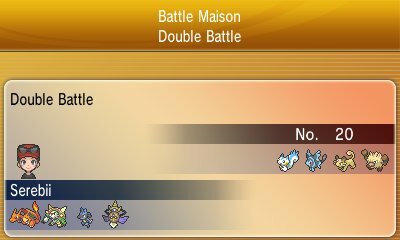 All battles you have with the Battle Chatelaines in the Battle Maison, and link battles, have the ability to be saved. However, there are numerous changes to the entire Vs. Recorder system. First off, you can store around 100 videos on your Vs. Recorder, with the videos being saved onto the SD Card plugged into the Nintendo 3DS system. When connected to the PSS, you will also have the ability to upload your videos, search for videos to watch and download, or delete your uploaded videos. When you select a video, as usual you have the ability to skip turns and stop immediately meaning you can view a specifically exciting portion of a video if you do so wish. However, there's one major change to the system. When you select a video, you now have the option to do a mock battle. This will allow you to battle the trainer that the video capturer was against, run by the AI. 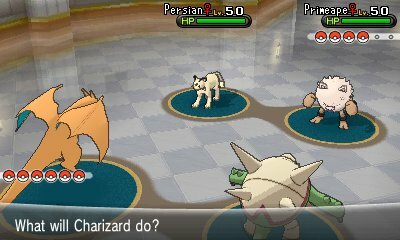 In this mode, you can pick between Pokémon in your party, or those within your Battle Box, allowing for you to completely test out certain strategies against a past opponent. This is possible to be done multiple times with no penalty.